December has been a very busy month. The wet weather continued until Christmas making life difficult as the slurry store was only holding its contents due to surface tension (as with many of our neighbours). 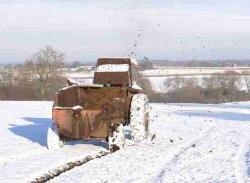 Relief to this problem came Christmas week when we have had a spell of frost and snow and some muckspreading was finally achieved. The night temperature fell to -11c at its lowest! Here is a picture of me muckspreading in/on the snow. 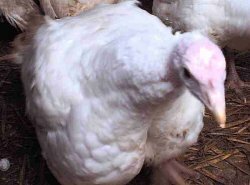 We had the annual trip to Dorothy's father's to help with the turkey plucking the week before Christmas and here is one for you to see as it studied my camera. 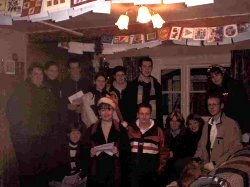 Just before Christmas we had the annual carol singers visit from the Middlewich young farmers club collecting for charity here they are (unfortunately I missed them this year). We have had 6 calves born this month 2 Simmental heifers, 2 Black and White bulls 1 Belgian Blue bull and 1 Black and White heifer. The Belgian Blue being born around noon Christmas day. 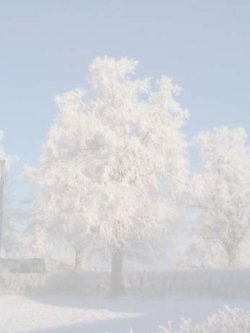 The frost however also brought its own problems with the heifer's water supplies in the stockyard and wooden shippon being frozen up. 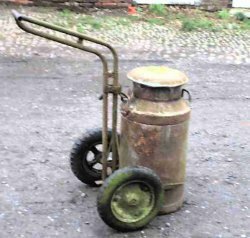 This led to me having to carry water to them using this old milk churn and truck, which is kept for such events. The 27th was an eventful afternoon as the 16 heifers still outside in the fields decided it was time they came in for the winter (to appreciate this fully visit the farm map page) and appeared on the Drive field having broken out from Peacocks field walked up the main road and in at the front gate (the thing was it was 30m(35yds) visibility and freezing fog at the time). A friend who was on the way to Northwich alerted me to them. 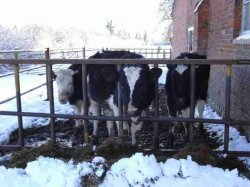 Sarah, Molly and myself put them in the 10 shippon and here they are eating silage in the snow. One of my Christmas presents has been a rain gauge and I am hoping to include a monthly rainfall report from now on. 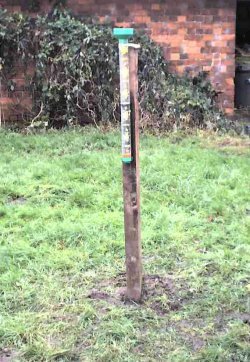 I fitted the gauge on the 1st in the rain and uncovered a grid buried in the lawn on my first attempt to put the post in.